With earnings season gradually winding down, the focus turns back to data releases this week with US CPI and a first look at Q4 GDP in Germany among the highlights. Trade, credit and CPI data in China will also be worth watching as will GDP in the UK (which missed earlier today). As always, it will be another busy week for UK Parliament on Brexit awaits while the threat of a US government shutdown is still in play for the end of next week. Also expect trade headlines not to stray too far from the market's view according to DB's Craig Nicol, while remaining earnings and a busy week for central bank speak should also keep us busy. modest decline in the annual rate to +2.1% yoy from +2.2%. It's worth noting that the BLS is due to make seasonal adjustments in the CPI on Monday and the PPI on Tuesday, which increases the uncertainty levels. The last time the BLS made a quality adjustment to wireless telephone plans it had the impact of lowering core CPI yoy by around 20bps. As for other data to watch in the US, the December monthly budget statement on Wednesday, December retail sales report (+0.4% mom core expected) on Thursday, initial jobless claims on Thursday (which have spiked in the last couple weeks), and January industrial production report (+0.1% mom expected) on Friday are worth a watch. In Asia the focus will likely be on the data out of China with January trade data due on Thursday and the January CPI and PPI prints due on Friday. We should also get the January money supply and aggregate financing data at some stage next week which should shed some light on the extent of growth stabilizing into this year. A reminder that markets in China are again open this week having been closed this week for Lunar New Year. In Europe, with increasing talk of a slowdown in the Euro Area, all eyes will be on the flash Q4 GDP report in Germany on Thursday. The consensus is for a +0.1% qoq reading which as a reminder follows a negative reading in Q3 (-0.2% qoq). Such a print would mean Germany would avoid a technical recession by a narrow margin but our economists in Germany do expect the German economy to contract again in Q1 this year. A reminder of their view here. Also out on Thursday will be the second reading of Q4 GDP for the Euro Area however no change from the +0.2% qoq flash reading is expected. Here in the UK it's a busy week for data with a first look at Q4 GDP on Monday (+0.3% qoq expected), December industrial production the same day, the January CPI data docket on Wednesday and January retail sales on Friday. Along with that data, DB's Nicol expects Brexit to remain a talking point next week with PM May's government sticking to its plan to present a motion on Thursday to Parliament which would allow lawmakers to debate and vote on alternatives to May's plan. No date has been set for a separate session to vote on May's overall Brexit deal however. Assuming no delay, the focus will likely centre around whether a retabled Boles/Cooper amendment on extending Article 50 would win a majority, which as a reminder it didn't last time. As for the EU, for now there has been no change in stance as to their Brexit position. It's worth noting that on Monday UK Brexit Secretary Barclay is expected to meet with EU Chief Brexit negotiator Barnier for talks on negotiating a new Irish backstop, so expect further headlines then. Staying with politics, Friday marks the deadline that stopgap funding for the US government expires. That means that if there is no resolution on the border wall issue, President Trump could potentially shut parts of the US government again. That being said, in recent days the newsflow has been a bit more encouraging with Republican Senator Richard Shelby saying that “we hope by Monday or over the weekend” to finalize a deal. As for the Fedspeak next week, there are a number of scheduled speakers. On Monday Bowman is due to speak on community banking. Tuesday evening we then hear from Powell however given the topic ("Economic Development in High Poverty Rural Communities") it would be a surprise if there was much for the market. Instead, Tuesday's scheduled talk by Mester on the outlook and monetary policy could be more significant. Meanwhile George and Mester again then speak on Wednesday, both on the economy and monetary policy. Bostic also speaks on Wednesday and Friday. Over at the ECB we're due to hear from Guindos on Monday, Lane and Lautenschlaeger on Wednesday, and Coeure on Friday. The BoE's Vlieghe is due to speak on Thursday. Elsewhere, earnings season is starting to wind down now in the US with about 65% of companies in the S&P 500 having reported. There are 63 companies due report next week including Chegg and NorthWestern on Monday, Sabre on Tuesday, Cisco and Paramount on Wednesday, Coca-Cola and Nvidia on Thursday, and Pepsi on Friday. In Europe we're due to hear from Michelin, Thyssenkrup, Metro, Akzo Noblel, Heineken, Nestle, Credit Suisse and RBS next week. Other potentially interesting events to keep an eye on next week include Euro Area finance ministers meeting on Tuesday to discuss the European Commission's economic forecasts, the EMU and EU budget in Brussels. Italian PM Conte is also speaking on Tuesday to the European Parliament as part of a series of debates on the future of Europe while OPEC's monthly oil report is out on the same day. On Wednesday we have the Riksbank meeting. Monday: The data highlight in Europe comes in the UK with the preliminary Q4 and December GDP prints. We'll also get the Bank of France industry sentiment reading for January along with the UK's December trade balance and December industrial production report. There is no data due in the US however we will get revisions to the CPI index. We're also due to get China's January foreign reserves data at some stage. Away from that, the ECB's Guindos is due to speak while UK Brexit Secretary Barclay is expected to meet with EU Chief Brexit negotiator Barnier for talks on negotiating a new Irish backstop. Earnings highlights include Chegg, NorthWestern Corp and Michelin. Tuesday: A quiet session for data. We'll get Japan's preliminary January machine tool orders overnight, however there's then no data of significance due in Europe. In the US we'll get revisions to the PPI index, December JOLTS job openings and the January NFIB small business optimism reading. The Fedspeak includes Mester and Powell, while Euro Area finance ministers are due to meet. OPEC will also publish its monthly oil market report. Earnings highlights include Sabre, Thyssenkrupp and Metro. Wednesday: The main data release is likely to be the January CPI report in the US. Prior to that we'll get the UK's January inflation data docket along with the Euro Area's December industrial production report. Also due in the US is the December monthly budget statement while late evening we'll get Japan's preliminary Q4 GDP print. As for central bank speak, early in the morning we're due to hear from the Fed's George before Mester and Bostic follow later in the day. The ECB's Lane and Lautenschlaeger are also due to speak. Earnings highlights include Cisco, Paramount, Akzo Nobel and Heineken. Thursday: The UK Parliament is due to meet again to vote on alternatives to PM May's defeated Brexit legislation. Data-wise, preliminary Q4 GDP prints for the Euro Area and Germany are the morning highlights while in the afternoon we'll get the January PPI report and December retail sales report in the US. The latest weekly initial jobless claims print and November business inventories are also due. China's January trade data is also expected at some stage. Earnings highlights include Coca-Cola, Nvidia, Nestle, Airbus, Renault and Credit Suisse. 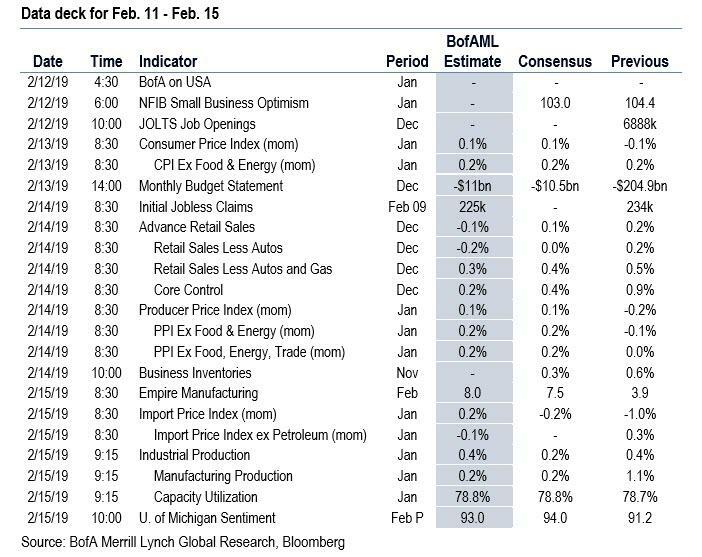 Finally, focusing just on the US, here is Goldman's preview of key events, which notes that the key economic data releases this week are the CPI report on Wednesday and retail sales on Thursday. There are several scheduled speaking engagements by Fed officials this week, including one by Chairman Jerome Powell on Tuesday. There are no major economic data releases scheduled today. 11:15 AM Governor Michelle Bowman (FOMC voter) speaks: Fed Governor Michelle Bowman will speak about community banking at an American Bankers Association event in San Diego. A moderated Q&A is expected. 12:45 PM Chairman Powell (FOMC voter) speaks: Fed Chairman Jerome Powell will speak on economic development in high poverty rural communities in Itta Bena, Mississippi. Prepared text and audience Q&A are expected. 6:30 PM Cleveland Fed President Mester (FOMC non-voter) speaks: Cleveland Fed President Loretta Mester will speak on the economic outlook and monetary policy in Cincinnati, Ohio. Prepared text and audience and media Q&A are expected. 7:30 PM Kansas City Fed President George (FOMC voter) speaks: Kansas City Fed President Esther George will speak on “Charting America’s Economic Course” in Kansas City. Audience Q&A is expected. 08:30 AM CPI (mom), January (GS +0.11%, consensus +0.1%, last -0.1%); Core CPI (mom), January (GS +0.22%, consensus +0.2%, last +0.2%); CPI (yoy), January (GS +1.48%, consensus +1.5%, last +1.9%); Core CPI (yoy), January (GS +2.05%, consensus +2.1%, last +2.2%): We estimate a 0.22% increase in January core CPI (mom sa), which would bring the year-over-year rate down one tenth to +2.1%. Our forecast reflects positive residual seasonality in the household goods and personal care categories, a boost from the end of prescription drug price freezes, an expected rebound in apparel prices, and a rise in the recreation services category from Disneyland ticket price hikes. On the negative side, we expect lower oil prices to weigh on airfares for a second month. We estimate a 0.11% increase in headline CPI (mom sa), reflecting a drag from lower gasoline prices but a boost from higher food costs. 08:50 AM Cleveland Fed President Mester (FOMC non-voter) speaks: Cleveland Fed President Loretta Mester will speak at a conference on the economic outlook in Lexington, Kentucky. Prepared text and audience and media Q&A are expected. 08:50 AM Atlanta Fed President Bostic (FOMC non-voter) speaks; Atlanta Fed President Raphael Bostic will speak in a moderated discussion at the European Financial Forum in Dublin. 12:00 PM Philadelphia Fed President Harker (FOMC non-voter) speaks: Philadelphia Fed President Patrick Harker will discuss the economic outlook at a luncheon hosted by the Philadelphia Fed. Prepared text and audience Q&A are expected. 08:30 AM PPI final demand, January (GS +0.1%, consensus +0.1%, last -0.2%); PPI ex-food and energy, January (GS +0.2%, consensus +0.2%, last -0.1%); PPI ex-food, energy, and trade, January (GS +0.2%, consensus +0.2%, last flat): We estimate a 0.1% increase in headline PPI in January, reflecting relatively firmer core prices but a decline in energy prices. We expect a 0.2% increase in both core measures of PPI, reflecting a rebound from the prior month and a continuation of the recent trend in producer prices. 08:30 AM Initial jobless claims, week ended February 9 (GS 220k, consensus 225k, last 234k); Continuing jobless claims, week ended February 2 (consensus 1,725k last 1,713k): We estimate jobless claims decreased by 14k to 220k in the week ended February 9, following a 19k decrease in the prior week. Claims in the state of California remain somewhat elevated after a 21k increase two weeks prior. 08:30 AM Retail sales, December (GS flat, consensus +0.1%, last +0.2%); Retail sales ex-auto, December (GS flat, consensus flat, last +0.2%); Retail sales ex-auto & gas, December (GS +0.2%, consensus +0.4%, +0.5%); Core retail sales, December (GS +0.1%, consensus +0.4%, last +0.9%): We estimate that core retail sales (ex-autos, gasoline, and building materials) rose slightly in December (GS +0.1%, mom sa), with soft growth reflecting the potential pull-forward of sales due to an early Thanksgiving in 2018. Soft department store sales suggest that the ex-auto, ex-gas category likely saw modest increases as well (GS +0.2%). We estimate flat growth in the headline measure due to an additional drag from lower gas prices. 11:00 AM Philadelphia Fed President Harker (FOMC non-voter) speaks; Philadelphia Fed President Patrick Harker will discuss approaches to leadership. Prepared text and audience Q&A are expected. 09:15 AM Industrial production, January (GS +0.2%, consensus +0.1%, last +0.3%); Manufacturing production, January (GS +0.1%, consensus flat, +1.1); Capacity utilization, January (GS +78.8%, consensus +78.7%, last +78.7%): We estimate industrial production rose 0.2% in January, with a small increase in manufacturing production and an expected increase in the utilities category. We estimate capacity utilization increased one tenth to +78.8%. 10:00 AM University of Michigan consumer sentiment, February preliminary (GS 95.0, consensus 94.0, last 91.2): We expect the University of Michigan consumer sentiment index to increase 3.8pt due to an end to the government shutdown and recovery in the stock market. 09:55 AM Atlanta Fed President Bostic (FOMC non-voter) speaks: Atlanta Fed President Raphael Bostic will speak to the Public Affairs Research Council of Alabama at their annual meeting in Birmingham, Alabama. Prepared text and audience Q&A are expected.